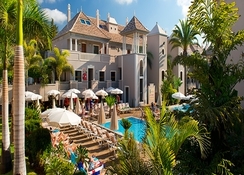 Marylanza Suites & Spa is one of the best hotels in Tenerife. It is perfect for a family holiday, with its two outdoor and one indoor pools, a gourmet restaurant and a sunny beach within walking distance. 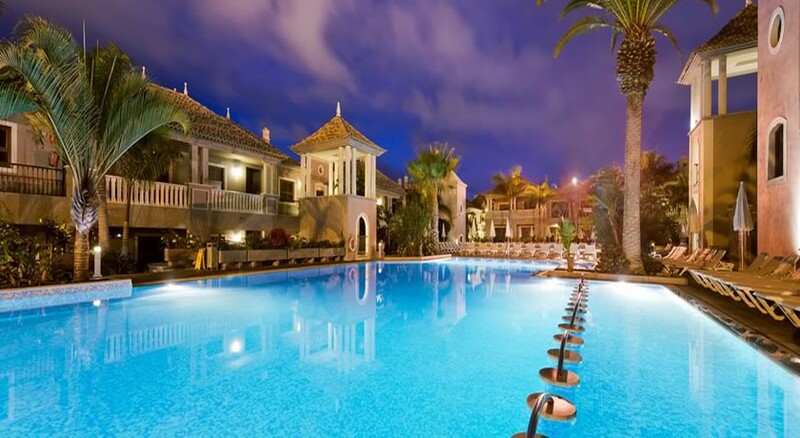 The resorts of Los Cristianos and Playa de las Americas are barely a 15-minute walk from the resort. Designed as an island villa, the rooms in Marylanza Suites and Spa are bright and spacious, with most of them looking out over the golf course and the pools. There are sun-loungers and parasols for you to enjoy soaking up the sun by the pool. The gourmet restaurant, serving Canarian and international specialities is popular, while there’s also a buffet restaurant and bars to give you plenty of menu choices. There is an on-site disco, with an exclusive space for kids, so you can enjoy dancing all night without having to leave the hotel. Check out the gym if you would like a session of Pilates or book a spa session to soak in a steam bath or get some beauty therapy. You can also play tennis, pool, squash or video games with the family. Marylanza Suites & Spa is located in Arona, 700 metres from Playa de las Vistas beach, with the resorts of Playa de las Americas and Los Cristianos within walking distance. The Tenerife Sur Airport is around 15 km away. 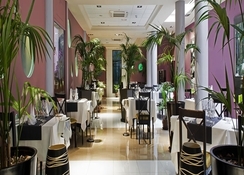 The Marylanza Hotel Tenerife is 1.5 km from the city centre, with shops, restaurants and nightclubs. 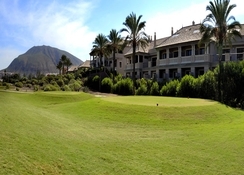 The complex overlooks the Las Americas Golf Course. Marylanza Suites & Spa is one of the best hotels in Tenerife south because of its 217 guestrooms that include Suites with Views, Superior Suites and Duplex Suites, which are bright, spacious and come with functional kitchenettes and attached balconies. From your room, you can look out at the golf course of Las Americas or the pool. Look forward to a white chocolate fountain and themed evenings at the restaurant, as you explore dining options at the Marylanza Hotel in Tenerife. The Tagoror buffet restaurant offers al fresco dining on the terrace and a separate section for kids, while the Kentia fine-dining eatery serves a gourmet menu. Check out the teppanyaki Restaurante Orijama to sample Canarian flavours. Drop in at the La Palapa Snack Bar by the pool for salads, meats and pasta, with a pool table to engage you. 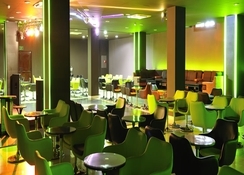 There’s also the Lobby Bar, Taste Bar and a disco, where you can enjoy alcoholic and non-alcoholic beverages. There are two outdoor pools, where you can enjoy the sunshine under parasols and sun loungers. The beach is at a walkable distance from the hotel, with the resorts of Los Cristianos and Playa de las Americas a 15-minute walk away. You can also play squash, pool, video games, table tennis and air-hockey. 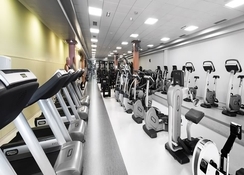 There’s a fitness centre where you can catch up on Pilates or swim in the indoor pool. To de-stress, book a session at the Spacio10 spa, which includes a hammam and steam bath. In the evenings, you can expect live entertainment and tribute acts. Or put on your dancing shoes and head for the disco, while the kids dance in their own mini-disco.